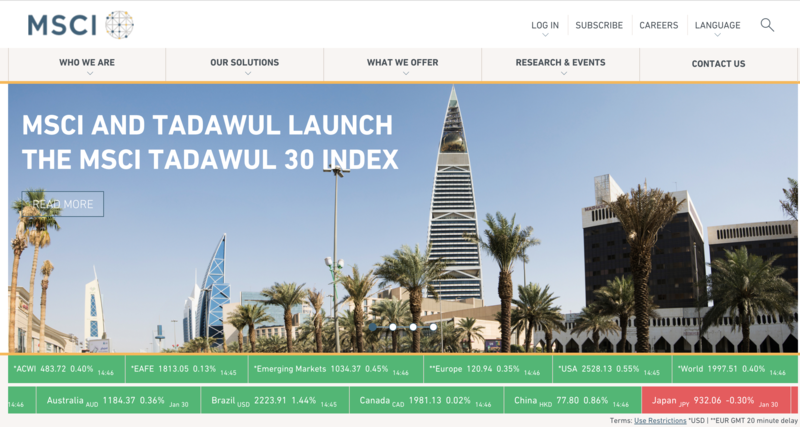 MSCI Inc. and the Saudi Stock Exchange (Tadawul) announced today the launch of the MSCI Tadawul 30 Index, a tradeable index, according to a press release. The Index is based on the MSCI Saudi Arabia IMI Index that represents the performance of large, mid and small-cap stocks of the Saudi Arabia equity market. The Index targets the top 30 securities of the MSCI Saudi Arabia IMI Index based on free float market capitalization with capping criteria, and is designed to be able to serve as the basis for financial products including derivatives and ETFs. MSCI did not name the companies that will be included in the index. The Tadawul is the biggest equities market in the six-member economic block of GCC, accounting for about half of the the region’s total market cap and 80 per cent of value traded on the regional exchanges.